A stint of warm air ( 60 F / 61 F. on Jan 12 - 13 ) accompanied by rain of 1.49", reduced a 12 inch snow depth to isolated patches. 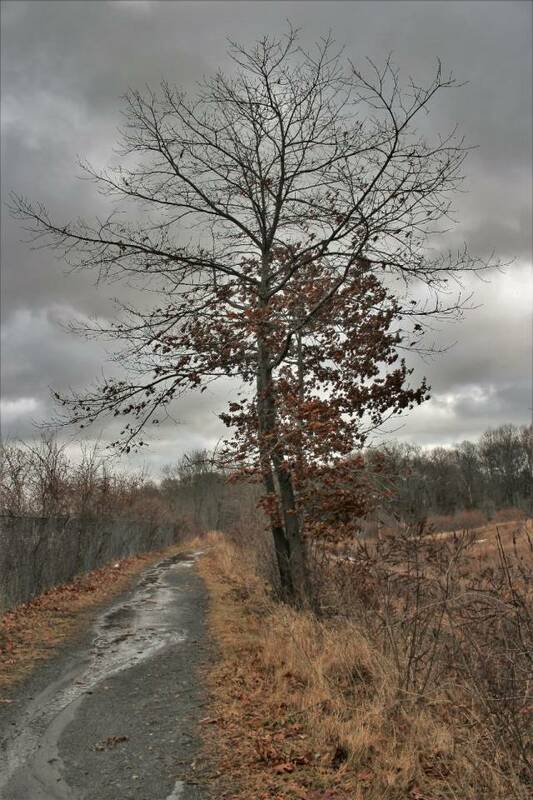 This image is of the "path"; a roughly one mile trail ( formerly the B&M railroad ) that runs west-east through Marblehead. This western portion of the path may reside in Salem. The trees shown have retained a fair number of leaves. Abscission which is the natural separation of leaf from twig in Autumn did not occur in many cases due to very mild weather. The retention of leaves is called marcescense. A moderate gale removed some leaves but many remain. Marcescense has become more noticeable over the years.